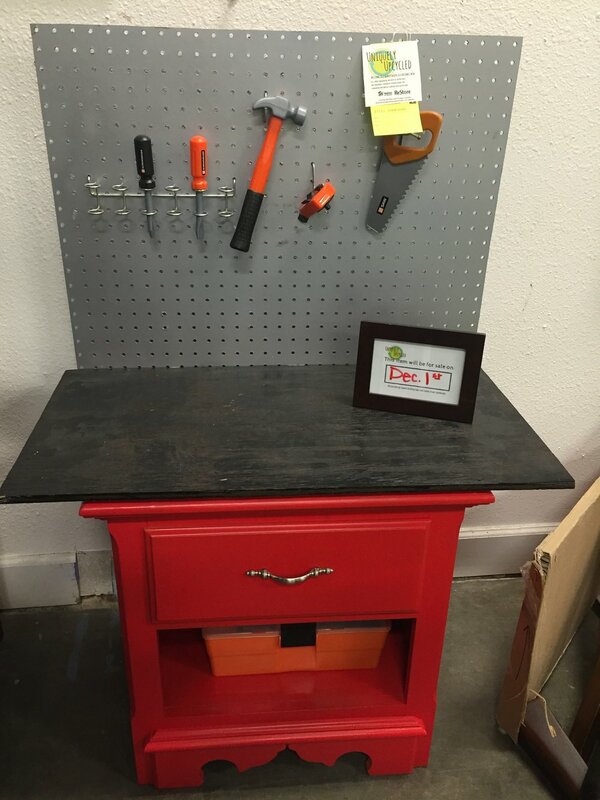 This volunteer program is designed to take extra inventory or damaged items and transform them into something unique to sell here at the ReStore. For example, we receive a lot of donated filing cabinets, but many people are straying away from the traditional use of a filing cabinet. Volunteers have worked on turning the filing cabinets into storage bins for outdoor gardening tools. Taking an old dresser and painting it, completely changes the look of a something simple into something unique! We repurposed old nightstands into a kid's tool bench (or play kitchen!). See more pictures from this workshop here. For this project, we took old fan blades and bed posts to turn them into wall art! Super easy! Interested in joining the Uniquely Upcycled Volunteer Program? 1-2 Lead volunteers to come in 2 Saturdays a month, 4 hours each shift. During these shifts, you would work with a few other volunteers on the projects that you wanted to tackle. More members of the Uniquely Upcycled Crew who can give 2-4 hours a week of creative time-- painting, brainstorming, and repurposing. No skills required here!